I've been to Georgia Aquarium more than a dozen times over the last 12 months and I find it fascinating every single time...and I continue finding exciting photo ops! Many of my friends have photos of themselves at numerous locales within the Aquarium on their Facebook accounts and one or two still have a photo from the Aquarium as their profile photo, even months after visiting...I like that. This particular photo is also in the Ocean Voyager gallery...the gallery I beeline to immediately upon arrival every time I go. Seriously and for real, of all the times I've been to the Aquarium I always go to Ocean Voyager first. Maybe I should mix it up a little bit for some diversity, but I'm thinking that will have to be a special occasion. 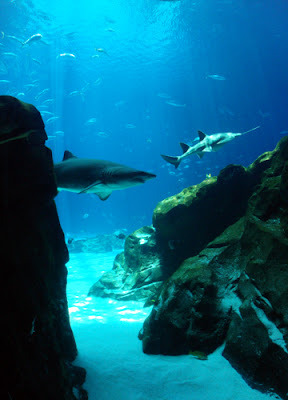 Until then, I'll first offer a "Hello" to Yushan and Taroko, two of the Whale Shark residents and then continue with my regular visitation with the other creatures of this water wonderland.